A driver stopped because police believed he was speeding was found to be over the alcohol limit. Gary Peck, 38, of Tranmere Road, Marton, pleaded guilty to drink-driving, driving without insurance and not in accordance with his licence. He was banned from the road for 14 months, fined £220 with £85 costs and ordered to pay £30 victims’ surcharge. Prosecutor, Pam Smith, said a police officer’s attention was drawn to Peck who he believed was driving a Renault Clio above the speed limit on Tranmere Road, on May 11 at 4.15am. At first Peck gave the officer a false name but then admitted his true identity. A breath test showed 57 micrograms of alcohol in his body - 35 is the limit. He had a previous drink-driving conviction from 2002. An agency worker who had been drinking swore towards police officers in Blackpool town centre.Kooner Harbinder, 33, of Withnell Road, South Shore, pleaded guilty to being drunk and disorderly. He was fined £140 with £85 costs and ordered to pay £30 victims’ surcharge. 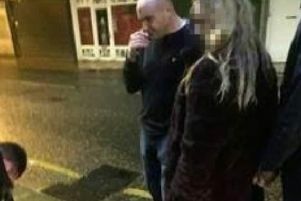 Harbinder, who was drunk, was warned numerous times about his behaviour but he continued to shout and swear in front of members of the public and he was arrested. A homeless man missed appointments with his probation officer. Simon Croft, 30, of no fixed address, pleaded guilty to failing to comply with a community order. Croft was told by District Judge Jeff Brailsford that the community order should continue and he would impose no further penalty on him. A probation officer said Croft had been sentenced to a 12 months community order with up to 30 days rehabilitation to be supervised by the probation service for an offence of assault. He failed to attend two appointments with his probation officer. It was his first breach of the order. Homeless services had tried to help Croft but he failed to turn up to appointments with them. Stephen Duffy, defending, said his client was homeless, had no benefits, was addicted to drugs and in severe pain from an abscess on the side of his face. A drug addict committed a £79 fraud on a Blackpool shop by falsely claiming he had bought two pairs of shoes from there. Lindsay, 44, of Caspian Place, Bootle, who pleaded guilty to fraud by false representation, appeared before the court via video-link from Forrest Bank prison. He was given a nine months conditional discharge and ordered to pay £20 victims’ surcharge by District Judge Brailsford. Prosecutor, Pam Smith, said on April 10 Lindsay went into TK Maxx and took two pairs of shoes from a display. intended to sell the gift card for about £40 and use the money to travel back to Merseyside. Lindsay told the judge that at the time of the offence he had been addicted to heroin and crack cocaine. Maya Senghore, 18, of Draycott Road, Grange Park, pleaded not guilty to assault on May 6. Senghore was given unconditional bail to her trial on August 22.